The very first iPhone was the iphone 2G which was released in June 2007. The price was £381 for the 4GB model and £457 for the 8GB model. This iPhone could fit in the palm of your hand and was named ‘2G’ because it made to work only with the 2G network rather than 3G. This original model is today considered a collector’s item and is now sold on sites like eBay for much more than the original price. Similarly to the 2G, the iPhone 3G is named so because it was made to work with the 3G network. This was the first apple phone which used 3G and was released in July 2008. The phone sold over 1 million units its first weekend of being released and was priced at £99, significantly cheaper than the 2G. It was marketed as “twice as fast. Half the price”. This model came in two different colours (black and white) and was sold with a two-year contract. The operating system software version used was iOS 2.0 and the phone received many updates allowing different features such as multimedia messaging (MMS) and a copy-paste function. 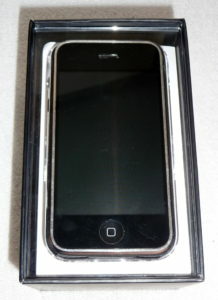 One year after the 3G was released, the iPhone 3GS was brought out. With ‘S’ standing for speed, the new model was stated to be “The fastest, smartest phone yet.” The iPhone 3G was then discontinued in 2010. At Apple’s Worldwide Developers Conference in San Francisco, June 2010, the iPhone 4 was announced. 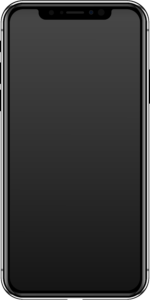 The device was called the thinnest smartphone in the world at the time by Steve Jobs himself. The phone was priced at £499 for the 16GB model and £599 for the 32GB model. This model came with a front facing built in camera, giving Apple an edge against their competitors. This also allowed video chat to be a feature, giving birth to Face Time. Just over a year later the iPhone 4S was released. This was the model which introduced the voice assistant Siri in October 2011. The iPhone 5 was the last Apple device to be overseen by Steve Jobs, as he passed away in 2011 aged 56. The phone was released in September 2012 and was priced at £529 for the 16GB model, £599 for the 32GB model and £699 for the 64GB model. Apple took pre-orders for the device and within 24 hours they had received approximately 2 million orders. 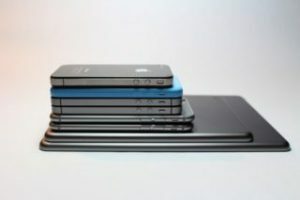 The iPhone 5 also enabled 4G and was thinner, lighter and taller than previous models. In 2013 Apple announced the iPhone 5C and 5S, discontinuing the iPhone 5. 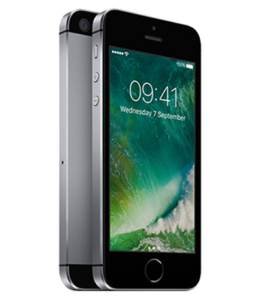 Though the iPhone 5 and its predecessors have now been discontinued, at Tech CPR we offer repairs on all of the old iPhone models. So don’t fret if you damage your beloved collectors iPhone 3G. In 2014, Apple released the iPhone 6 and 6 Plus. This was the first iPhone to come with a plus option. The Plus screen sizes was 5.5 inches which was significantly larger compared to the regular 6’s 4.7 inch screen. The iPhone 6 was priced at £539 without a SIM. This model also came with many improvements, including an upgraded 8-megapixel camera, increased battery life and the introduction of Apple Pay. The 6 and 6 Plus were Apple’s main phones up until the release of the iPhone 6S and 6S Plus just under a year later. When the iPhone 6 Plus was first released there was a lot of talk about how easily they could be bent and broken due to how thin they were. Tech CPR offers iPhone repairs, so if you have an iPhone 6 Plus and discover it’s been damaged then bring it down to our shop or contact us. This model was released in September 2016 and also came with the option of a Plus model. It was priced at £549 for the 7 and £699 for the 7 Plus. Both models were available in a few different colours, including black, red and grey. They also both came with either 32GB or 128GB of storage. The iPhone 7 came with an impressive 12-megapixel camera and was also the model of iPhone which saw the loss of the headphone jack and the addition of water-resistant technology. Making iPhones water-resistant was a much needed addition as water damage has been a problem for many people over the years. Here at Tech CPR we offer iPhone water damage repair, so if you don’t have one of the latest water-resistant models of iPhone then there’s no need to worry. The iPhone 8 was released in September 2017 and once again came with a Plus option. With this model, Apple switched from their aluminium casing to an all-glass design. This gave the device a smart, sleek look, but does make it more prone to damage. The two phones were made available in a range of colours including silver, gold and space grey. They were priced at £699 for the 64GB iPhone 8 and £799 for the 64GB 8 Plus. Then the iPhone X was released in November 2017 on the tenth anniversary of the iPhone. This model came with the removal of the home button, a 5.8 inch screen, organic LED display and wireless charging. These new and improved features drove the phone’s price up to £999. Since the iPhone X, Apple have released 3 more phones; the iPhone XR, iPhone XS and XS Max. The most expensive of these three would set you back £1449 and the cheapest is priced at £749. However, these prices could change with Apple’s boss Tim Cook’s hint that the company could be lowering prices. Different models of iPhones all come with amazing features and abilities, but one issue which seems to follow each model is screen damage. Here at Tech CPR we offer iPhone screen repair and have a no fix no fee guarantee. So if you’re having any troubles with your current iPhone or fancy treating yourself to a technical upgrade, contact us on 01246 452319 to speak to a member of our friendly team or pop into our store in Chesterfield.